Cajohns Black Cherry Vanilla Hot Sauce, 6.8oz. 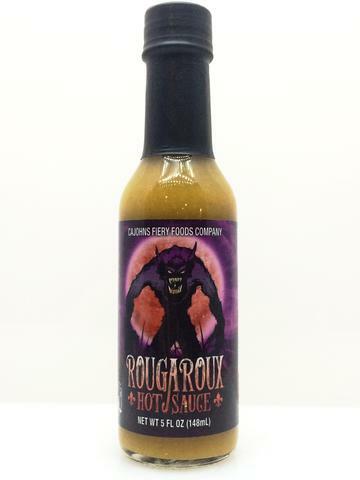 CaJohns Rougaroux Hot Sauce (5 fl. oz. / 148 ml.) Rougaroux, a legendary cyptid said to be a bayou-dwelling werewolf with glowing red eyes and razor-sharp teeth. This sauce is a classic Louisiana Style created with Caribbean chiles which possess a bite of half a million Scoville Heat Units! While the finished product is viciously hot, it is tremendously tasty as well. Enjoy! Heat Level: 10 POP: (percentage of peppers) 41% Ingredients: Chile Peppers (Yellow Scotch Bonnet, Yellow Trinidad Moruga Scorpion, Yellow Trinidad 7-pot, Fatalii), Vinegar, Cane Sugar, Sea Salt, Garlic, Spices, Lemon Extract. Cajohns The Formidable Apprehension Hot Sauce, 5oz.